Maintaining the good health of our computer investments is very important. Considering the substantial monetary initial investment, plus the hundreds (even thousands) of hours of time to create documents and files that are usually irreplaceable, we need to also invest in “tech insurance” to protect these assets. A great utility will fit this need. TechTool Pro 11.0.2 is the latest version that I’m reviewing (my previous review was nearly 4 years ago at applejac.typepad.com/techtoolpro8), and is simply the best utility I’ve ever used to test and repair my 13” MacBook Air, 15” MacBook Pro and 27” iMac. This version is Mojave compatible, and takes advantage of the latest technologies introduced with the release of macOS 10.14.14 (which I’m using). Plus even more features . . . 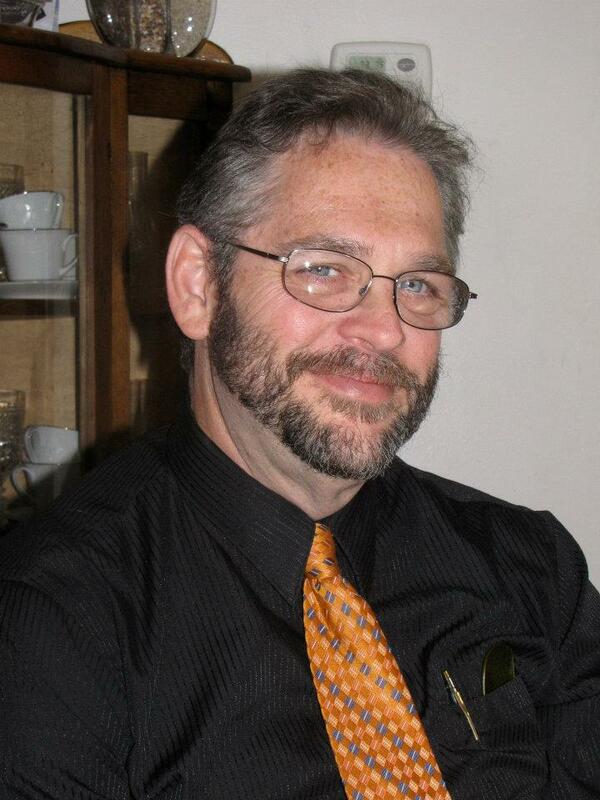 It may seem a little overwhelming when first provided the opportunity to use TechTool Pro 11, but the ability to use each is simple and straight-forward. The techie details are here for those who are interested, but the power is immediately accessible to any user. The interface is logical and easy-to-understand, and the tools can be used immediately, or in the background, depending on the user’s needs. It is important to mention that, although most of the controls are intuitive, a 135-page manual is also easily accessible in a downloadable PDF file that provides detailed explanations about every tool and report available. If that is not enough, a Techtool Pro 11 Knowledge Base can be reviewed online with answers to commonly-asked questions. And, if you really want to dig deep and/or converse with other Techtool Pro 11 users, the drop-down Help menu item also is a doorway into the Micromat Forum for this product (they have one for each of their products). Obviously, they are very committed to extensive support! For more details about these benefits and other interesting information, go to micromat.com/techtool-pro where TechTool Pro 11 Full Version is available for $129.99, TechTool Pro 11 Standard Upgrade for $29.99 (Intermediate and Legacy Upgrades add $20 and $30, respectively), TechTool Pro 11 Business Pack for $249.99, and TechTool Pro 11 DVD for $19.99 (will require current TechTool serial number). Micromat, leaders in diagnostic maintenance and repair for Mac, also has a worldwide ongoing offer featuring a 50% discount for the full version of TechTool Pro 11 to all Apple user group members. A 10% discount for any of the other Micromat products is also available. To access, just click on the discount link: https://www.micromat.com/mug-discount. If the health of your Mac is important to you, I recommend this utility as the best all-purpose solution available. I’ve tried many utilities over the past 30 years, and TechTool Pro 11 now has ALL of the tools and best performance together in one integrated package! Flash drive or thumb drive or U disk or pan drive . . . whatever you call portable solid-state storage that we have used for years . . . the newest computers and tablets now go beyond the traditional USB-A connector to embrace the new USB-C standard — faster and more robust, for better data transmission. The latest iPad Pros use this new port to great advantage, but most flash drives don’t work correctly with them, until now! The UNIREX MicroSD U1 is a 5-in-1 reader and SD adapter that can be successfully used with all of Apple’s MacBooks and iPads released the past two years. It features connections to USB-A, USB-C and USBmicro at USB 3.0 speeds from regular SD and microSD cards from 32GB to 256GB. It has removable cap covers on both ends. This unit can efficiently transfer data from SDXC, SDHC, SD, MicroSDXC, MicroSDHC and MicroSD cards, which makes it perfect for USB-C and microUSB supported smartphones, tablets, laptops & other devices. As a result, I get smooth full HD or 4K video recording and playback with the latest high-resolution standards at ultra-fast data transfer and retrieval speeds. Not only that, but it is also waterproof, x-ray proof, temperature proof and shockproof in a small lightweight device (0.4” x 0.8” x 3.2”). It is compliant with SD Card Association specifications and USB backward compatible with earlier USB devices. The package includes an SD adapter that converts a microSD card to traditional-sized SD card. I acquired my reader at CES 2019, and have used it for several months with impressive results. It works very well and quickly with my new 13” MacBook Air, 15” MacBook Pro, 27” iMac, and other computers, for moving any and all data. But, without any special apps, only photos and videos can be transferred to my new 12.9” iPad Pro (this is an Apple restriction which we hope will be removed soon). My only issue with this unit is that the removable caps are not attached to the reader, so they can be mislaid mistakenly. This UNIREX Reader can be bought at http://unirex.com/product/microsd-u1-with-5-in-1-reader-sd-adapter/ for $34.99 or $54.99 USD (includes either 64GB or 128GB microSD card). I highly recommend this versatile and fast storage solution. Discover Preview's hidden features in "Take Control of Preview"
Most Mac users know Preview as a simple app (included free with macOS) that’s used to display PDFs and graphics. Sure enough, it does do those things. But did you know that it’s also a powerful image editor, that it can annotate and manipulate PDFs in numerous ways, and that it can capture images right from your camera or iOS device? In fact, Preview has dozens of amazing features, making it one of the most underappreciated built-in apps on the Mac. With the help of Take Control of Preview, you’ll master this powerful yet unassuming app to make the most of your images and documents. You may even realize you no longer need more-expensive tools for those kinds of tasks! I hope you find this updated book as useful as I did. The visual quality and clarity of smart phone images has now become so good that they are frequently used more as cameras, than as communication devices. I have used many different iPhone holders, grips, selfie-sticks, and handles over the years, but have now found a battery case that truly improves my photography skills. The new Shuttercase is a slender black easy-to-mount case with a 3000mAH battery inside a detachable leather-surface Camera Handle articulated with a special shutter button and thumb rest. It almost feels like my Sony DSLR mirrorless camera with this handy grip. It also provides a convenient way to sit my iPhone on my desk for easy viewing, or to take a picture remotely using my Apple Watch as the shutter button. Since they designed it to mimic the shape and feel of classic dedicated cameras, they added a camera handle with a battery inside which doubles the camera’s power while shooting. Thus, taking photos with the iPhone becomes like an old-style camera, but more convenient, more comfortable to control, and free to create. It has a solid feel with durable and reliable design that can be used with any camera app on the last four generations of iPhones. If I were to suggest adding anything, it would be a 1/4” mount for a tripod (but I have brackets with this mount that fit the case just fine). Installing the iPhone into the case is simple and straight-forward, as is its extraction, when not needed. The battery requires separate insertion of the battery cable (which is securely nested in the handle), but it can be easily replaced with the included flat cover when the battery is not needed. The case has an embedded mechanical button on the top (when in horizontal position) for very convenient shutter use. The unit is designed for right-handed use, so lefties must adapt. A rubber thumb-rest is quick to install which provides an excellent way to grip the case for one-handed shooting (a second is also thoughtfully included, should the first be damaged or lost). I was pleased that an 8” tether was included that attaches to the case corner below the battery to protect against accidental drops. A detachable mount for add-on lenses (available in black or white) is also included, compatible with the SiRui and Moment V2 lens for the first iPhone lens (Shuttercase plans to release its own lens soon). A video about this lens can be seen at https://vimeo.com/283858341. The unit ships in a very attractive box and includes one Shuttercase, a 3000mAH battery camera handle, one micro USB-USB charging cable, one grey pouch for camera handle, one black nylon tether rope, one leather-surface effect hand grip to replace the camera handle, and two thumb buttons (no add-on lens or leather strap is included). It measures 3” x 5.8” x 0.2” (0.9” at the camera handle), and weighs in at 2.3 oz for the case plus 2.4 oz for the battery grip, together less than 0.3 lb. This is lighter than the iPhone XS Max (7.4 oz) or the iPhone X (6.2 oz) . . . when the full unit is added, the total weight is still about 2/3 of a pound, which is considerably lighter and more manageable than most cameras I’ve ever had. Shuttercase for iPhone Xs/X and XS Max (I have tested both) are regularly priced at $79.99 (USD), but has been sale priced at $59.00 (USD) for a limited time (go to https://www.shuttercase.com/collections/iphone). Shipping is free worldwide by USPS, and it includes a one-year warranty and 30-day free return if not satisfied. The iPhone 8Plus/7Plus version is available for $49.00 (USD), an additional camera handle battery grip is available for $28.00 (USD), and a separate lens mount is $1.50 (USD). More information is available at https://www.shuttercase.com/products/shuttercase-xs-for-iphone-xs. Get more out of Siri on all your Apple devices! In our customer survey last summer, when we asked which Apple software products people would most like to read about, Siri got the most votes. 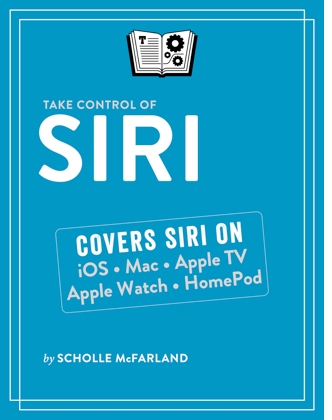 In keeping with our theme of giving you what you’ve asked for, I’m delighted to announce our latest book, Take Control of Siri by former Macworld editor Scholle McFarland! This book is the definitive guide to Apple’s voice-controlled digital assistant across all platforms—iOS, Mac, Apple Watch, Apple TV, and even HomePod. If you own any Apple device with Siri support, this book will tell you everything you need to know about being more productive, saving time and effort, and having fun with Siri. And you may be surprised at how powerful Siri has become since its early days! As always, you can download a free sample of the book from our website. One more thing. This week we also shipped a minor update to Glenn Fleishman’s popular book Take Control of Your Apple ID, which now goes into more detail about two-factor authentication and addresses issues faced by Apple developers with more Apple IDs than devices to set up authentication codes on. If you have any questions or confusion about how your Apple ID works or how to solve problems with it, I hope you’ll check out this updated book. All of the 331 pictures and 19 videos depicted during my slideshow presentation (before the break), can be viewed (with sound on the videos) by clicking on this link: https://www.icloud.com/sharedalbum/#B0aGIcgc2GIe2I3. In addition, most of the gadgets brought back from CES were shown during the second half of the meeting, as well as predictions of what has yet to come. The PDF slideshow illustrating these items can be downloaded and viewed by clicking here: Gadgets to Show. If you liked what you saw here, consider attending CES 2020 in Las Vegas next January 7-10, 2020. Members At Large: Joe M., Jim S., Julie S., Sue S., Alice K., Ann L.
$25 Gift Card - Judy M.
Apple Branded Water Bottle - Ron H.
Apple Branded Notebook - Jim S.
Apple Branded Bag - Peggy L.
Apple Lapel Pin - Greg B. / Jane S.
Interested in the gadgets presented by our Officers at the November meeting? Check out this copy of the presentation for direct links to any of the products shown!